The choices seem to be down to three: Jabari Parker, Andrew Wiggins or Trade out. While nobody would ever imagine trading out of the first pick in a draft where there are such high ceiling players, we ARE talking about the Cavs. One rumor has the Orlando Magic offering the 4th and 12th picks plus scoring forward Aron Afflalo. If Cleveland is truly in love with Joel Embiid this might make some sense as they could try to add Embiid with the 4th pick and add a second lottery pick and a good player in return. On the other hand if Embiid’s injury problems are chronic and Wiggins or Parker turn out to be…well you know the rest. As for Parker, there are rumors swirling that he wants no part of Cleveland and would be much happier in Milwaukee. If I am the Cavs I would not listen to anyone or anything and just take the best player, pair him with Kyrie Irving and move on. In my eyes that would be Andrew Wiggins. Wiggins has the most upside of anyone in the draft and will be a future star in the league. Where will Joel Embiid land? Is Embiid’s injury bad timing or good timing? Depends who you ask. I would say bad timing for Joel Embiid but maybe lucky timing for the Cavs? As the draft banter has progressed in the last month or so all I kept hearing was Embiid was going first to the Cavs who were drooling at his potential. My thoughts? Always take the best player which to me means Andrew Wiggins 1st, Jabari Parker 2nd and Joel Embiid 3rd. I wondered if Cavs management had been stuck in a cave for the past 30 years and never heard the stories of Sam Bowie and Michael Jordan or Greg Oden and Kevin Durant? Is it possible they would pass on Wiggins and Parker to pick the injury prone big man with potential? Bad timing for Philly who at pick number 3 had to be giddy in thinking the Cavs would leave them Wiggins or Parker. How lucky can Cleveland be? First they come all the way up to win the lottery and snag the 1st pick and then an injury might actually force them to take the best player? WOW!! 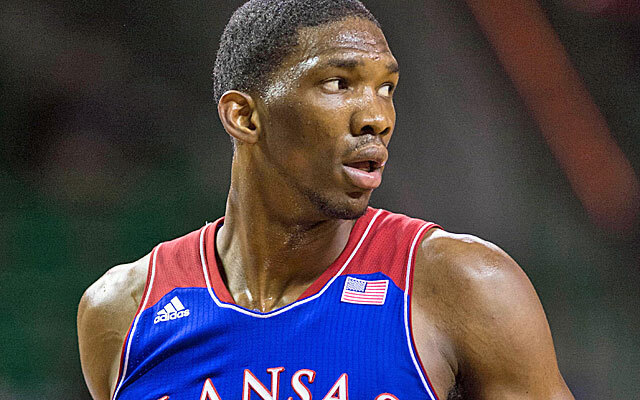 With that said, please understand that this is not to denigrate Joel Embiid who is an exceptional prospect. Just not the top prospect. So where does he land? I think the highest spot he could go is 3rd. The 76ers will choose between Embiid and Dante Exum or possibly maneuver within the top 6 or 7 with someone who will take a shot at Embiid. I don’t think he will last past Boston at number 6 and the teams most involved seem to be the 76ers, Celtics, Lakers and Magic. How will LeBron and Melo’s free agency impact the draft? When you are chasing free agents of this magnitude there are always two things to remember. First, the more cap room you have the better off you are and second, only one team gets them and the rest are left in limbo. So what does this mean for the draft? Teams will look to couple expiring deals with draft picks to create room for marquee names. The Lakers have already offered #7 with Steve Nash’s contract to suitors. The Bulls are looking to offload their 2 first rounders with Carlos Boozer to fit a max guy. Houston, Miami and OKC are all looking at moving out of the bottom of the first round and into the top of the second round where contracts are not guaranteed. The NBA draft has become a chess board where cap space has become more valuable than a mid level prospect. Expect to see at least a half dozen and potentially more first round picks move tonight. All the movement will be designed to free up valuable space and the beneficiaries of that could be teams like Philly, Utah, Detroit, Phoenix, Cleveland and Milwaukee. Those are the key teams that will have the maneuverability to add a player with an expiring contract without trading one away plus get a sweetener in return. Should be a very interesting night. I will not include trades but I expect at least 6 or 7 and maybe as many as 10 or 12 before the night is over. We hope that this NBA season will be as fun for you as it will be for us. We look forward to keeping you covered this NBA season.